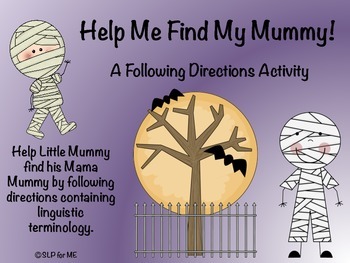 ****** Please do not buy this activity if you have my other mummy activity, as this one is included in it. ***** If you may have accidentally, please email me at the below address and I will send you a different activity!!! 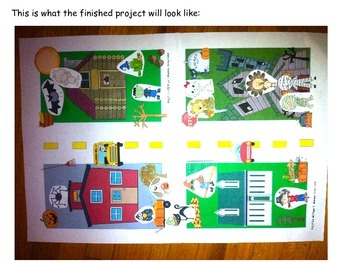 This activity targets the skill of following directions containing linguistic concepts. You could additionally address listening skills that the students would be required to request the items after hearing parts of a story, written by me in this case, repeating what the characters say and then completing the directive stated. Directives contain the prepositions, on top, in between, over, next to, etc. 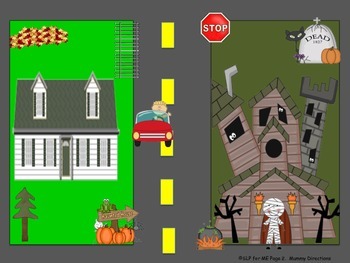 Clip-art for this activity was purchased from www.ScrappinDoodles.com and downloaded from www.mycutegraphics.com.